• Made from hard-wearing texturised 1000d MTP fabric. • Colour - British MTP (Multi-Terrain Pattern). 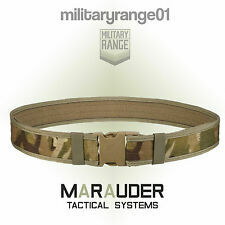 • Muti-Terrain Pattern stiffened combat belt. No2 Khaki Tie. A used British Army brown/khaki old-style pre-FAD 1980 Pattern No2 Dress tie. Woven wool. Brown/khaki colour (. Condition: Used. Ends will be frayed. SKU : TieKhaki. ). • Muti-Terrain Pattern stiffened combat belt. • 50mm side-release buckle. 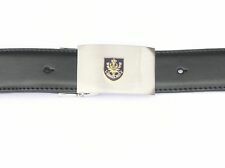 British Officers Sam Browne belt cross strap and sword frog. Sandhurst clip for ease of using. 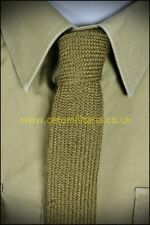 Wool Tie, Fawn (New) A new/unissued British Army wool tie in fawn. Condition: New (cut from roll). 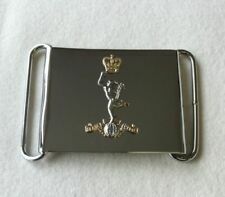 For sale is a used German Army belt buckle. Only buckle side. Braces, British Army MoD Grey Elastic. A pair of used MoD/Army issue braces. Grey elastic with leather tabs to fix to buttons on trousers. Braces, British Army/MoD. SKU: BracesGrey. Black Tie (RAF, RN). A new MOD-issue black tie. 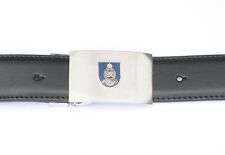 White Courlene Parade Belt, 46" (New) A new/unissued British Army/RAF/Royal Navy white courlene (woven plastic) No1/No2 ceremonial parade belt. 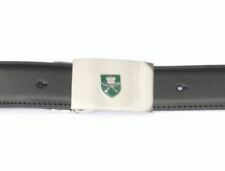 NB: You are selecting the maximum length of the belt, not the waist size of the wearer.